Background/Aim: Esophagectomy is a major operation with high mortality and morbidity, for which anastomotic leakage and necrosis of esophageal substitute are serious and potentially fatal complications. 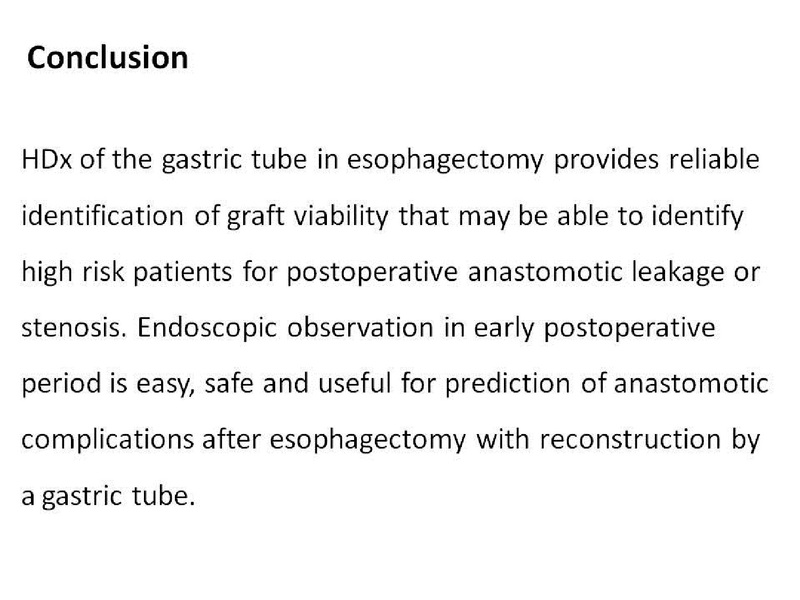 The aim of this study was to evaluate the viability of the gastric tube and esophagogastric anastomosis in esophagectomy. Methods: Of 39 patients who had undergone esophagectomy during the year 2008-2009, graft viability of the gastric tube was evaluated by both intraoperative thermography and postoperative endoscopy in 34 patients. Hemodynamic index (HDx) calculated from thermal image was used for intraoperative graft viability, while postoperative graft viability was evaluated by endoscopy at 2 weeks after operation. Correlation between intraoperative and postoperative findings of graft viability was then investigated. Results: Anastomotic leak (AL) occurred in 2 patients (5.9%). Eight other patients developed anastomotic stenosis (AS) and required endoscopic dilatation (23.5%). Endoscopic appearance of patients with AL showed full layer graft ischemia with breakdown of the anastomosis, whereas in AS, ischemic appearance was limited to the graft mucosa. Ischemic degree on the graft mucosa seems to correlate with frequency of anastomotic dilatation. HDx of the patients with AL or AS were significantly smaller than those without AL or AS (p=0.0035). Conclusion: HDx of the gastric tube in esophagectomy provides reliable identification of graft viability that may be able to identify high risk patients for AL or AS. Endoscopic observation in early postoperative period is easy, safe and useful for prediction of anastomotic complications.